Previous studies on islet regeneration from the laboratories of Gilles A. Lajoie (Western University) and David A. Hess (Robarts Research Institute, London, Ontario, Canada) revealed that transplants of human bone marrow mesenchymal stem cells (hBM-MSCs) led to the emergence of small recipient‐derived islet‐like structures in the pancreas, thereby producing the β-cells required to battle the insulin deficiency associated with both type 1 and type 2 diabetes [1-3]. In search of mechanistic insights, subsequent proteomic analysis of secreted factors then highlighted Wnt‐signaling from hBM-MSCs as a central pathway mediated islet regeneration . With this knowledge in hand, the duo now returns with a new STEM CELLS study that aimed to discover if secreted factors alone could regenerate the mouse islet by injecting hBM-MSC conditioned media into the mouse pancreas . Kuljanin at al. now report on how the identification and validation of important hBM-MSC derived factors that promote islet regenerative may permit the development of cell‐free regenerative therapies for diabetic patients. 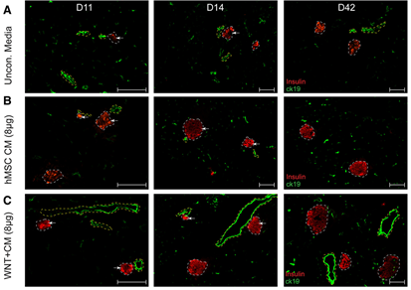 Initial analyses discovered that intrapancreatic‐injection of concentrated conditioned medium derived from hBM-MSCs stimulated islet regeneration in a dose-dependent manner without the need for cell transfer. Overall, the authors observed significantly reduced hyperglycemia, increased levels of circulating serum insulin, and improved glucose tolerance in a streptozotocin‐treated murine model of diabetes. Interestingly, the generation of conditioned medium in the presence of a glycogen synthase kinase 3‐inhibitor, which activates Wnt/β-catenin signaling, further accelerated and widened the observed β‐cell mass recovery. By next studying the consequences of conditioned medium injection, the authors demonstrated that multiple regenerative factors promoted the emergence of proliferating insulin-positive cell clusters next to the ductal region. Cell emergence was then followed by the expression of the NKX6.1 β‐cell transcription factor in glucagon-positive cells, suggesting the conversion of pancreatic α‐cells into β‐cells, and then by accelerated β‐cell maturation with increased expression of the MAFA, a β‐cell transcription factor required for insulin production that marks mature, functional insulin‐secreting β‐cells. Of note, this regenerative process occurred over four days after a single administration of conditioned medium. While these results support the development of cell-free regenerative therapies for diabetic patients, the authors note the requirement for preclinical testing in relevant models of autoimmune diabetes and the exploration of alternate modes of delivery before translating their findings to human patients. Of additional interest, the authors also highlight the additional role of hBM-MSC secreted factors in immunomodulation, an ability that may additionally dampen autoimmunity while boosting islet regeneration in type 1 diabetes patients. For more on how studies of mesenchymal stem cell secreted factors can promote the development of a cell-free treatment of diabetes, stay tuned to the Stem Cells Portal! What is the minimal set of hBM-MSC secreted factors that may make up a defined cell-free treatment for diabetes? Does the injection of hBM-MSC condition medium or a set of defined factors represent a relevant treatment approach for human diabetic patients and what additional steps are required to reach this phase? Will the maintenance of pancreatic regeneration require multiple long-term treatments and are there any side-effects to this strategy? Hess D, Li L, Martin M, et al., Bone marrow–derived stem cells initiate pancreatic regeneration. Nature Biotechnology 2003;21:763. Bell GI, Meschino MT, Hughes-Large JM, et al., Combinatorial Human Progenitor Cell Transplantation Optimizes Islet Regeneration Through Secretion of Paracrine Factors. Stem Cells and Development 2012;21:1863-1876. Bell GI, Broughton HC, Levac KD, et al., Transplanted Human Bone Marrow Progenitor Subtypes Stimulate Endogenous Islet Regeneration and Revascularization. Stem Cells and Development 2012;21:97-109. Kuljanin M, Bell GI, Sherman SE, et al., Proteomic characterisation reveals active Wnt-signalling by human multipotent stromal cells as a key regulator of beta cell survival and proliferation. Diabetologia 2017;60:1987-1998. Kuljanin M, Elgamal RM, Bell GI, et al., Human Multipotent Stromal Cell Secreted Effectors Accelerate Islet Regeneration. STEM CELLS 2019;37:516-528.